David Hockney 1960-1970, London, 1970, p. 62II (illustrated). N. Stangos, David Hockney by David Hockney, London, 1976, p. 60, fig. 46 (illustrated). B. Kerber, Bestände Onnasch, Berlin and Bremen, 1992, p. 50 (illustrated in color). P. Melia and U. Luckhardt, David Hockney Paintings, Munich and New York, 1994, p. 39 (illustrated). London, Institute of Contemporary Art, Four Young Artists, 1962. Brussels, Palais des Beaux-Arts, Pop-Art Nouveau Réalisme, February-March 1965. Nijmeeg Museum, David Hockney, schilderijen, tekeningen en prenten, 1975, no. 8 (illustrated). Berlin, Nationalgalerie, Aspekte der 60er Jahre, February-April 1978, p. 37 (illustrated). Los Angeles County Museum of Art, David Hockney: A Retrospective, February-April 1988, p. 118, no. 10 (illustrated). London, Tate Gallery, David Hockney, October 1988-January 1989, no. 19. 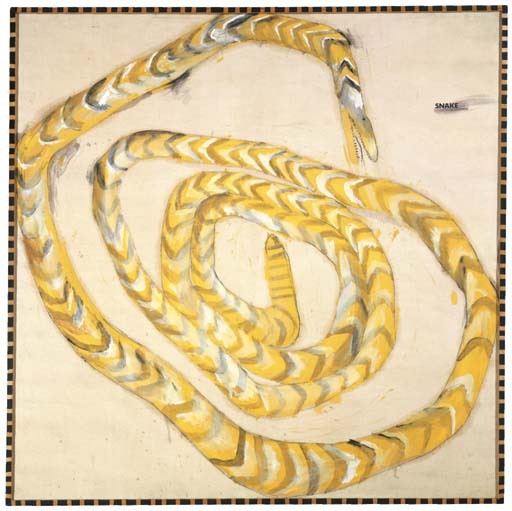 The Snake represents Hockney's preoccupation with style and more specifically, with the flatness of the paint surface. "At that time I was much more conscious of the current ideas about painting. For instance, flatness: flatness was something that people really talked about then, and I was interested in it. Everyone was going on about Jasper Johns's pictures: here was the flatness thing, and it appeared in later abstractions too. The Snake is my comment on it, a version of it, in that the only illusion is that inside the frame the snake is lying on a canvas; the canvas itself isn't painted. The handmade frame is meant to suggest a mechanical version of the snake. The starting point of this picture was an attempt to animate a target, which was a popular theme among students at the time--it was probably derived from Kenneth Noland and Johns. I wanted to give my target painting a completely different subject, but all the time there was this idea of flatness. I thought it was something I should be involved in" (D. Hockney, quoted in N. Stangos, ed., David Hockney on David Hockney, New York, 1976, pp. 87-88. ).